You're going to love the 2007 Nissan Altima! A great car and a great value! This 4 door, 5 passenger sedan provides exceptional value! Comfort and convenience were prioritized within, evidenced by amenities such as: leather upholstery, tilt and telescoping steering wheel, and cruise control. Smooth gearshifts are achieved thanks to the 3.5 liter 6 cylinder engine, providing a spirited, yet composed ride and drive. Our sales reps are knowledgeable and professional. We'd be happy to answer any questions that you may have. We are here to help you. Discerning drivers will appreciate the 2013 Nissan Sentra! Providing great efficiency and utility! This 4 door, 5 passenger sedan still has less than 90,000 miles! Nissan prioritized practicality, efficiency, and style by including: variably intermittent wipers, a trip computer, and 1-touch window functionality. Smooth gearshifts are achieved thanks to the efficient 4 cylinder engine, and for added security, dynamic Stability Control supplements the drivetrain. We know that you have high expectations, and we enjoy the challenge of meeting and exceeding them! Please don't hesitate to give us a call. 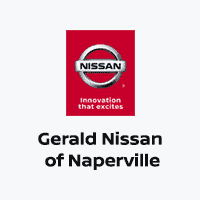 This 2009 Nissan Murano SL is proudly offered by Gerald Nissan North Aurora This Nissan Murano SL defines excellence in an SUV. It has the convenience of limitless boundaries paired with city sophistication. Few vehicles can match the safety and comfort of this AWD Nissan Murano SL. With enhanced performance, refined interior and exceptional fuel efficiency, this AWD Nissan is in a class of its own. The look is unmistakably Nissan, the smooth contours and cutting-edge technology of this Nissan Murano SL will definitely turn heads. More information about the 2009 Nissan Murano: The 2009 Murano sits in a crowded crossover SUV segment, but it has no shortage of features that set it apart. The redesign is an effective evolution of the car's popular look, and Nissan's 3.5L V6 is widely regarded as one of the best powerplants in the automotive world. Coupled with the chassis it shares with the Altima, the Murano's car-like reflexes, ample power, creature comforts, and spacious interior make it the ideal candidate for getting people and cargo from Point A to Point B in a comfortable, sporty, entertaining manner. Strengths of this model include Excellent, reliable Nissan 3.5L V6, sporty and capable handling, stylish, aggressive design, and luxury in the top-line LE trim.